Two Panels overlap in the same slide-channel. In addition, release top panel to slide to bottom. 1” flexible gasket accordingly provides seal between aisle containment panels and server cabinets. Fusible link or magnetic release holds up top panel. Adjustable-sized panels fill gaps between aisle for hot or cold containment and for shorter cabinets. Standard self-closing sliding door. In addition, door opening is 84” x 38” & ADA compliant. Full-height barrier panels fill gaps, as a result cabinet rows prevent hot or cold air leakage. Attach headers to our standard sliding or hinged doors to extend to the height of the cabinets and/or upper aisle containment. The Cool Shield channel frames several types of clear or opaque panels. Overlapping strip doors attach directly to ceiling panel framing. Wired electromagnets attach to a junction box. Furthermore, junction box gooes to fire control panel relay or daisy chain to other junction box. Electromagnet holds two light-weight clear containment panels at the seam. Full-length hinges allow panels to swing down into aisle upon release allowing gas or water based suppression to enter the aisle. Magnets, wires and junction box specifically feature industry standard 4-pin connectors for simple installation. Strips to fill gaps caused by shorter cabinets cut easily and attached to lower frame. The Cool Shield channel creates a frame around the aisle containment area to affix strips at both top and bottom to prevent air leakage. Cool Shield strips specifically have an ASTM E84 Class 1 rating which exceeds data center standards set by NFPA 75. Aisle entry Strip Doors attach to lower framework. 12” wide strips have 3” overlap to maintain air seal. Double-hinged doors are self-closing to minimize hot/cold air loss. 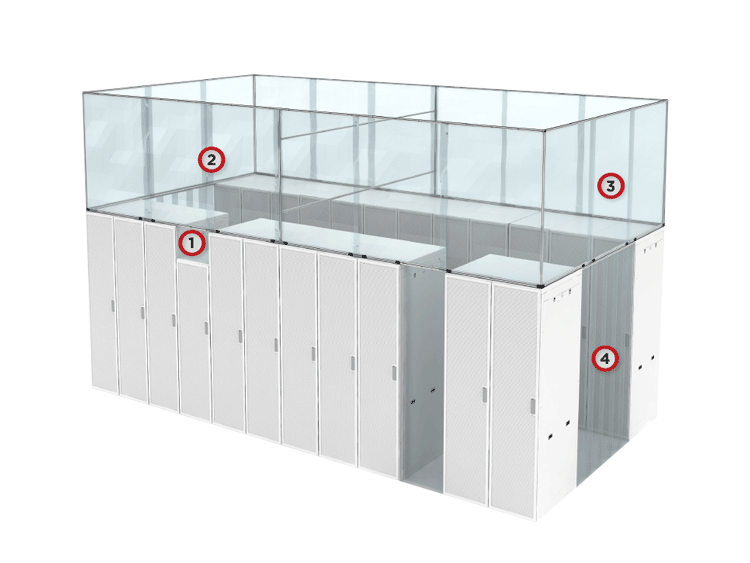 Clear aisle containment panels can be UL94 or FM Global rated. Thermally activated ceiling panels melt away and harmlessly fall to ground prior to fire suppression release. The Cool Shield channel specifically frames a ceiling at the height of the tallest cabinet. Fixed or adjustable panels extend to tops of shorter cabinets. Attach ceiling frame to cabinet or suspend from above by attaching to ceiling, strut, rod or beams. Self-closing sliding door sized to fully cover server cabinet side panels. Fixed solid panels sized from tallest potential cabinet height to ceiling. Removable strip hangers sized to cabinet width and attached to lower channel. Full-height overlapping strip wall maintains aisle containment integrity until deploying cabinets. 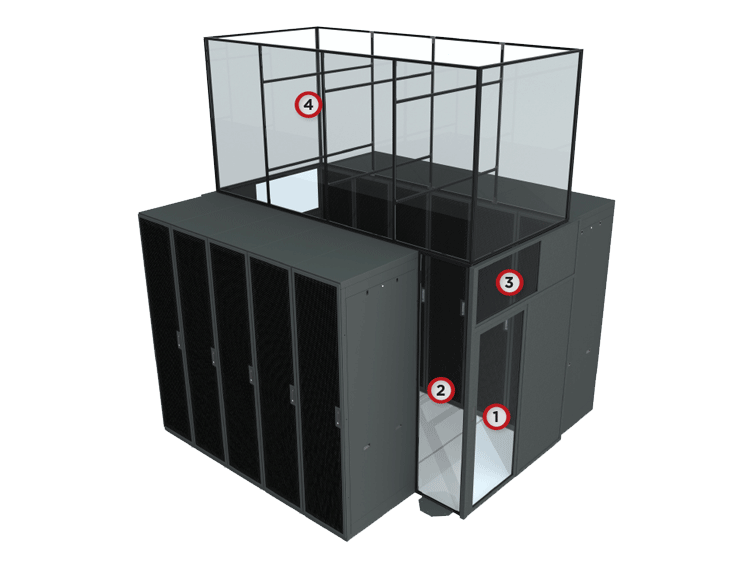 Our versatile aisle containment solutions allow both new and existing data centers to maximize their cooling efficiency within either hot and cold air systems. 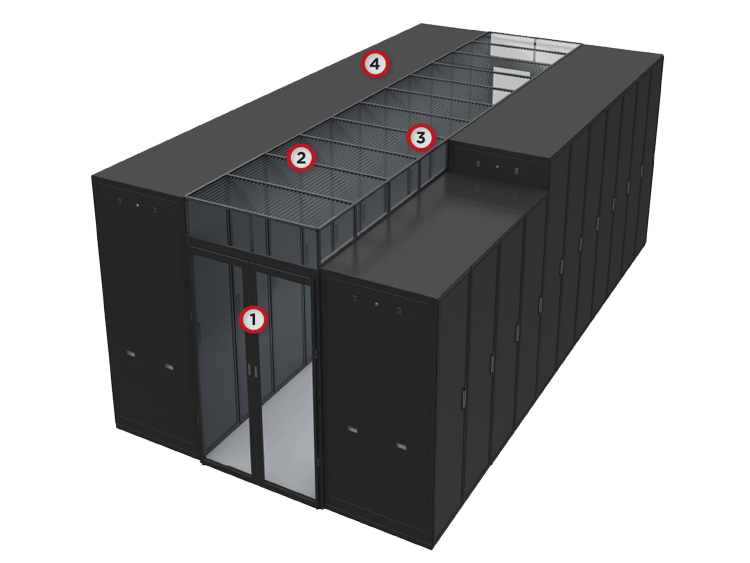 Cool Shield provides customers with versatile, turnkey containment solutions for new or existing data centers. 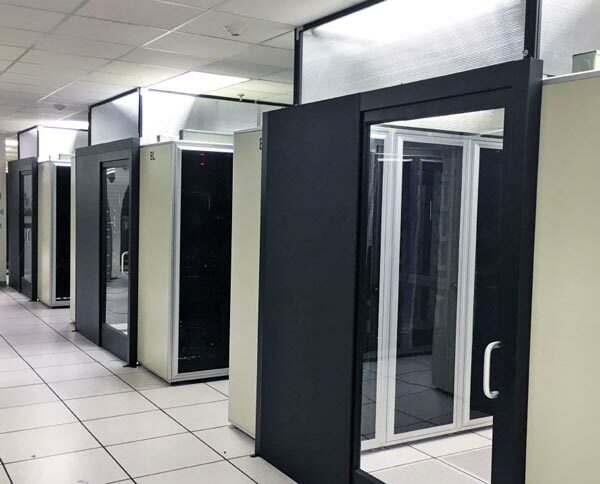 Our offerings range from a single row in a server room to entire data center facilities to self-supported systems, including either hot or cold aisle containment. 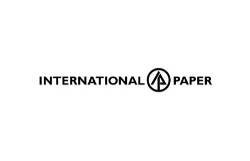 We offer professional installation, construction project management and retrofit aisle containment design. Our team of experts are ready to design a custom containment solution that fits both your facility, and your budget. 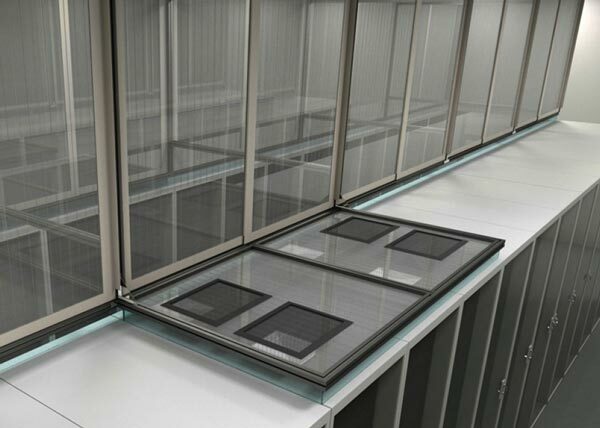 Hot-air and cold-air containment can improve the efficiency of conventional data center cooling systems currently in place without a large site overhaul. Choosing the best containment option for your facility can save you upwards of 40% in annual cooling system energy costs, which corresponds to almost a 15% reduction in power usage effectiveness (PUE) annually. 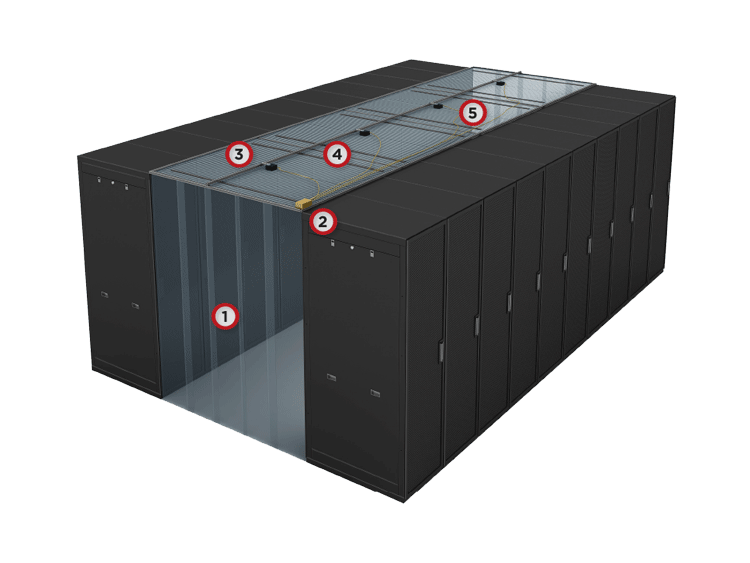 Hot aisle and cold aisle containment refer to the layout design for server racks and other computing equipment in a data center. Maintaining ideal server operating temperatures efficiently can be achieved by separating the cold airflow (cold aisle) going to the equipment from the hot exhaust air (hot aisle) coming from the heated equipment. By creating this separation, a data center manager maintains equipment temperature that is uniform and predictable, preventing the likelihood of sensitive equipment from overheating and data loss. In a typical data center, significant expense is committed to providing the energy required to maintain acceptable (safe) intake temperatures for system equipment. 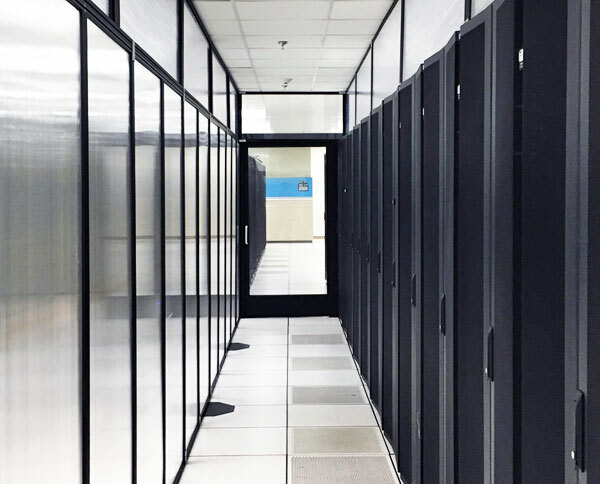 A recent study shows that data centers without an effective aisle containment system result in more than 50 percent of energy consumption. Choosing either a hot or cold solution can effectively enable significant reductions in energy costs. 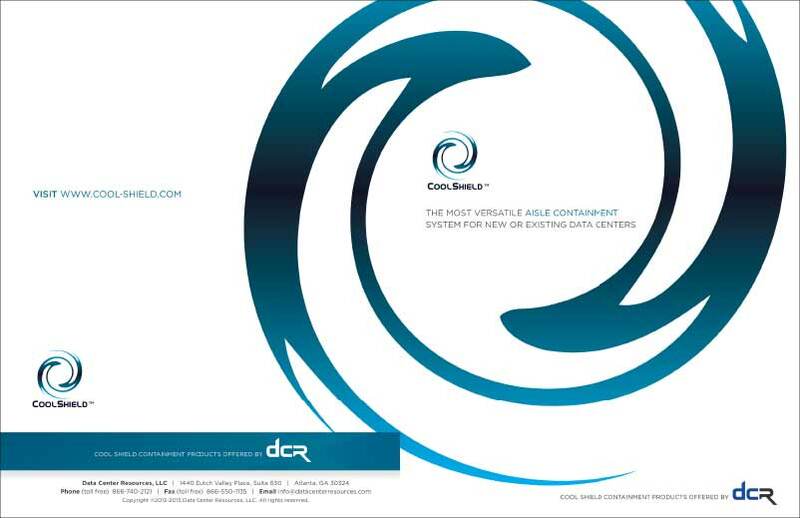 Learn more about our Containment Solutions. The industry leading Cool Shield Aisle Containment System is a solution designed to be versatile, efficient, functional and cost-effective. At the heart of it lies our proprietary aluminum channel. When using our channel, Data Center Managers have the flexibility to request containment of nearly any configuration in a new or existing work space. 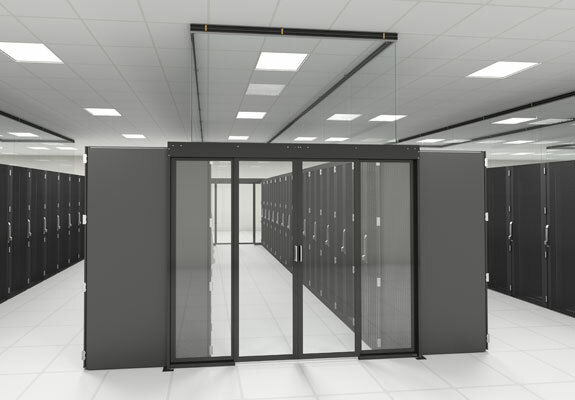 The Cool Shield system supports design and installation of custom aisle solutions for any size data center. Our system provides a nearly complete seal of all containment channels, effectively preventing the mixing of supply and exhaust air. The results are improved efficiency and lower energy usage. Proprietary Cool Shield Data Center Manager Software is a containment-specific monitoring solution to help safely increase set points. Cool Shield's software monitors conditions such as power issues, high temperatures, humidity and water. Our clients are able to ensure that elevated conditions in data centers are known. Data Center Managers have the ability to take the appropriate action before damage occurs. 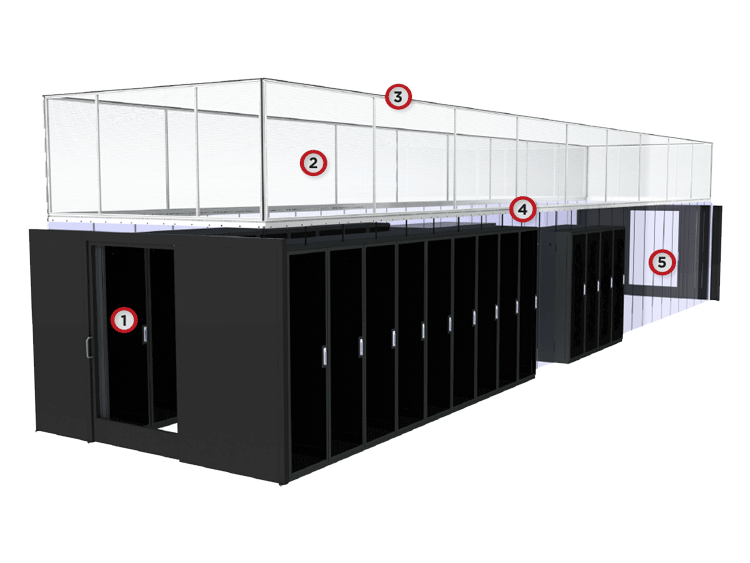 Cool Shield's Aisle Containment Systems feature a comprehensive solution used by the majority of data center managers. Our systems are designed to direct airflow through hot equipment while optimizing cooling efficiency. 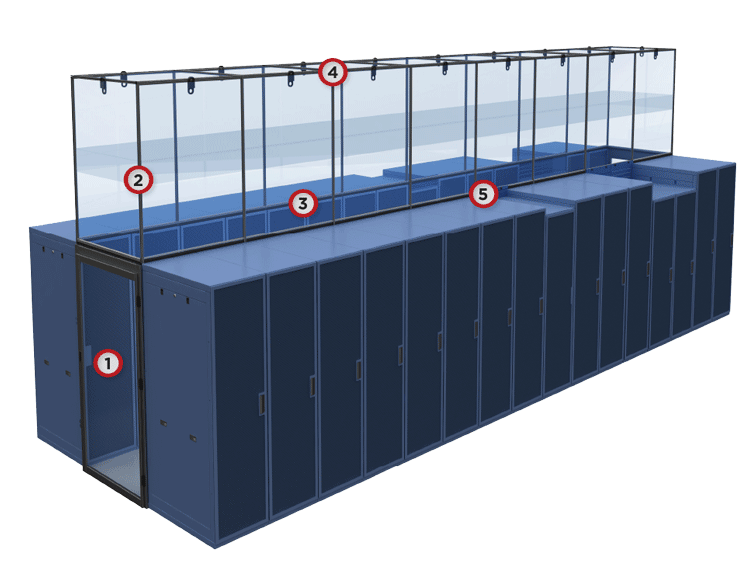 Aisle containment systems' components work together to separate cold air required to cool the equipment from hot exhaust air that the equipment forces out, effectively optimizing cooling. Serving customers across North America, Cool Shield has become a sought after aisle containment solutions provider for data centers across the USA and Canada. Every project presents new challenges that require innovative design and implementation. With our years of dedication and experience we have learned to handle any and all obstacles with precision and expertise. Learn more about data center services. Cool Shield's unique aisle containment channel allows for flexibility in data center configuration. Our channel accommodates demanding specifications and critical site conditions. As a data center manager, you deserve top industry reliability and support. Cool Shield has committed to developing and maintaining strong relationships with industry-leading aisle containment manufacturers. Working with top brands and top producers allows us to offer our clients comprehensive, integrated solutions, while our resources allow us to maximize power and cooling efficiency in data centers of all sizes. Contact us today to have one of our experienced Project Managers work with you on your next data center project. Many of the world’s largest companies trust Cool Shield for aisle containment.